Whether you are looking for a birthday party for 20, 50 or even more guests, we can accommodate your group. 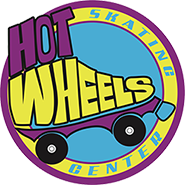 Why have your party at Hot Wheels? Roller skating parties are family and budget friendly. We even offer "skate mates" for our skaters who are learning. It's super easy to organize! We offer different packages to accomidate your party needs. Weather is never a problem at Hot Wheels! Rain, shine, snow, heat....we are OPEN! We do all the set up and clean up. We have a large 21,000 sq. ft. building and over 700 pairs of rental skates. In addition, we have arcade games, so there is plenty of room and something to do for everyone. Every package includes skating, drinks, invitations, paper goods and a FREE 30 day returning skate pass for the birthday child It's simple, all you have to bring the kids and the cake! No outside food, this includes ice cream, or drink is permitted, except the cake. We require a $25.00 non-refundable deposit ($50 for private parties) and accept cash, Visa, MasterCard or Discover. Additional Birthday T-shirts are $10, only 1 T-shirt is provided for each birthday party package. Skate Mates are not included.